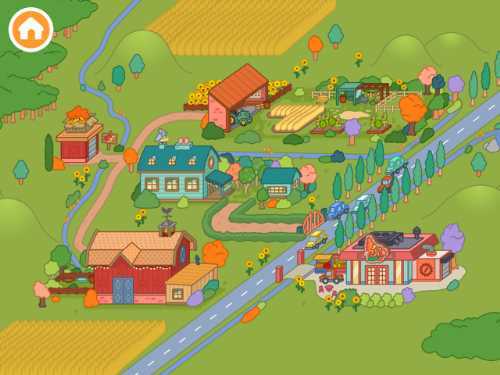 This interactive farm environment does a wonderful job of teaching kids about rural life, and it can spark their creativity to tell farm stories. 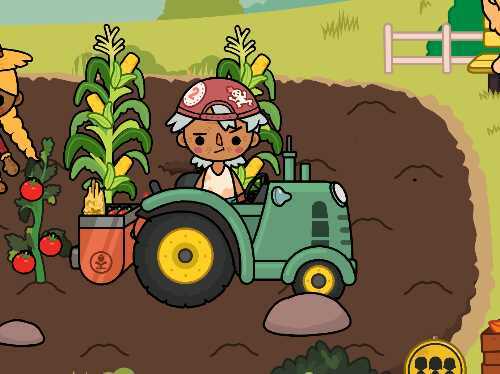 Toca Life: Farm puts kids in charge of running their own farm. They can drive tractors, plant and water crops, harvest fruits and vegetables, care for animals, and much more. The app provides kids with 29 characters and lots of animals to place within the five locations. There are fields for planting and harvesting of crops, a barn for the animals, a house, a storage shed, and a store to sell your produce and purchase supplies. As with the other Toca Boca apps in the Toca Life series (which includes Toca Life: Town, Toca Life: City, and Toca Life: School), this app provides kids with the tools to create their own video stories, using the characters and the app's different locations. In any scene, kids can tap on the movie reel icon in the upper right to start recording the movements and player-created dialogue of the characters on the screen. The app allows multi-touch, so that two or more players can be animating characters at once for the movie. 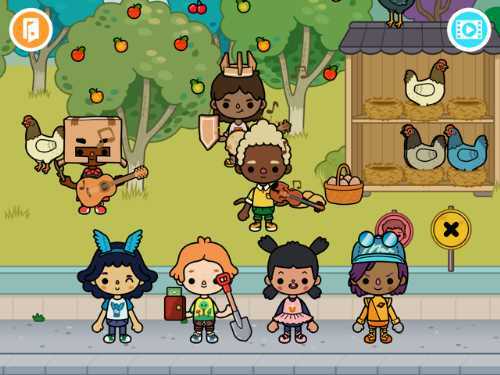 Toca Life: Farm provides kids with a lot of content to check out. Each of the five scenes expands to the left and the right by scrolling. And within these scenes, players can interact with most items found. If you plant a seed and then water it, a plant emerges from the ground for harvesting. In the barn, you can milk the cow and collect eggs from the chickens. If you move masks or new sets of clothing to characters, they will put them on. There's even a food-making machine at the store where combining different items produced on the farm creates new items to be sold at the store. Kids can produce things like pizza, by combining a tomato and freshly harvested wheat, or soy milk or soy sauce from a pile of soy beans. Toca Life: Farm is an outstanding simulation app for kids because it puts them in charge of their learning. 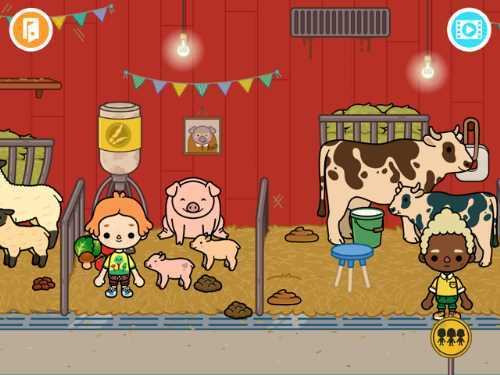 By offering typical farm settings, the app lets kids explore how to raise crops (with or without using a tractor), care for animals (including mucking out their stalls), milk the cow and bottle her milk using an in-barn milk tank, form a band to play some twangy music, help a vet checkout sick animals, and more. 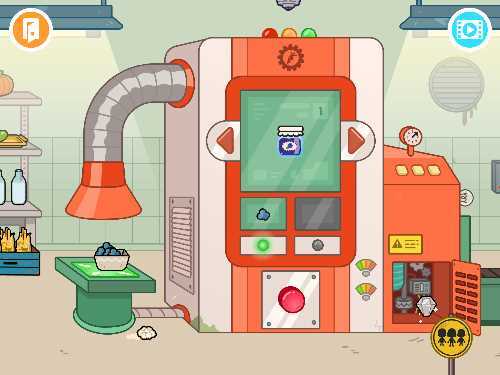 The food-making machine found in the store allows kids to discover what ingredients are found in common foods. For example, after picking fruit, players can turn it into jam. Milk can be made into cheese; and wheat can morph into many kinds of breads. If kids first make jam and next make a roll, they can combine the two to create a jam filled donut! The 29 characters reflect diversity of age, gender, and race (and even include some aliens), making them easy to use in telling stories. In each scene, there is even a wheelchair for placing a character. The characters can carry various items and can be moved between scenes be simply placing them in a storage area at the bottom of the screen that holds all the unused characters. After moving to a new scene, you can then bring any character in the storage area into the new scene, and it will still be carrying the items it had before. The filming tools are simple, so kids can easily create two-minute movies. And after dressing up characters and moving them into new scenes, you can easily reset the whole app from the main opening page. This farm app's upbeat and exciting vibe makes exploring rural living something that all children will enjoy. 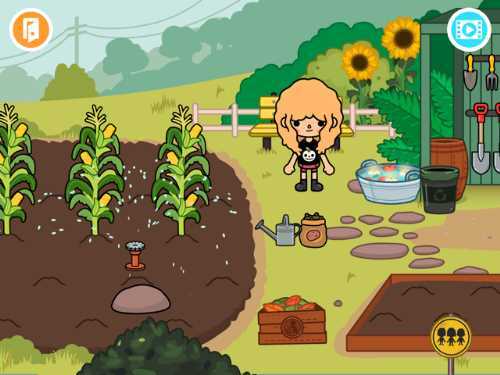 Don't miss Toca Life: Farm -- it's a kids' app worth buying. The sweet spot for Toca Life: Farm is ages 6-8; but younger kids will enjoy the app if they are playing with a parent or older sibling. And kids older than age 8 might get a kick out of creating movies using these diverse and funky characters and all the fun environments. Since Toca Life: Farm appeals to all kids, it is a great app to give as a gift to a grandchild or to place in a library of the best kids' apps. This kids' app review of Toca Life: Farm was written by Jinny Gudmundsen.